Rock Armstead needs to get the ball 25 times for the Owls to win. At first, glance, expecting the Owls to win in Central Florida’s environment may be a bridge too far Thursday night (7:30, ESPN). That’s only if the Owls have the same kind of offensive game plan Montgomery employed in trying to take the bridge at Arnhem in World War II–trying to use paratroopers against two divisions of German Armor or, as the British spell it, Armour. Similarly, if Brigadier General Dave Patenaude takes the same offensive approach he has in the past three games–mostly passes to the sidelines and fades to the end zone–he’s going to get slaughtered like Monty did in the Battle of Market Garden. Fades and sideline routes are the Temple equivalent of paratroopers. This time, the key to the game is matching Armor with Armor. For the Owls to win, they have to assume that Heisman Trophy candidate Milton McKenzie is going to play and set their game plan around their own star, Ryquell Armstead, who must play for the Owls to have any chance. I have no inside info but did watch him bounce around on the sidelines 10 days ago and he had no limp and was moving around pretty well. Plus, he’s single-digit TUFF. Give the ball to Rock Armstead–we’ll call him Tank for this game–and help him out by giving him as many lead blockers as possible. Since Patenaude doesn’t believe in using the fullback as a lead blocker, he is going to have to dust off the Maryland game plan and put the tight ends in motion to create just the tiny holes Rock needs to rip off 2-, 3-, 4- and 7-yard type runs against the 91st-ranked FBS run defense. Any good General will tell you it’s always a good strategy to attack the weakness of your enemy. Fortunately, UCF has a chink in its armor and Temple has Armstead to take advantage of that weakness. Pass only off play action once the run is established and only to move the sticks and keep the clock rolling. Armstead will have to carry the ball 25 times for Temple to win and none of those should be out of an empty backfield where a linebacker can key on him. That way, two things are accomplished–long scoring drives for Temple and keeping the ball out of McKenzie’s hands. Limit McKenzie’s possessions and he won’t be able to do things like ring up 45 points (as he did against Pittsburgh). The cumulative effect will allow Armstead to do what Anderson did and rip off enough big ones that both wear down the UCF defense and keep the Temple defense fresh. This is Temple’s Super Bowl and taking a page out of the Tuna’s super playbook is probably a wise approach. Certainly, he turned out to be a better General on the football field than Monty did in Market Garden. Anything outside of that thinking and winning in Orlando may be a bridge too far for these Owls. The MD game plan could be just what the doctored ordered to keep the Owls’ championship hopes alive. They like to talk about measurables–height, weight, speed, vertical jump, strength–when the focus is on the athlete. Accurately assessing those measurables, and weighing it against the intangibles, often determines the success of an organization. There are measurables that determine the success of coaches, too, and the No. 1 thing is wins versus losses, but other factors can be weighed. Against Villanova, Patenaude put up nine offensive points while coaches in the same position with less talent (Stony Brook, 29; Towson, 45 and even Maine, 13) put up more against that same defense. Those figures are remarkably consistent with last year’s ones as none of the Owls’ offensive stats above were in the top 50 in the nation. At the end of last year, Collins announced a staff shake-up where he named Ed Foley the head coach in charge of the offense but kept Patenaude in the OC role. It’s been quite apparent that Foley’s position is just lip service with Patenaude holding the keys to this Ferrari. He’s crashed it into the wall for the second-straight year. We’ve seen the same failings this year as last with the offense and Collins is just as responsible as Patenaude if not more so. Last year, Collins called Nick Sharga “the best fullback in the country” but our charting of plays had Sharga playing an average of 4.7 plays per game as a fullback. Shouldn’t “the best fullback in the country” be in there, if not for every down, at least for 20 offensive plays? The team’s current fullback, Rob Ritrovato, is largely limited to the same special teams’ role and he has punched the ball out for Temple recoveries twice in it. You’d love to see a blocker like that lead the way for tailbacks like Ryquell Armstead and Jager Gardner, but Patenaude stubbornly won’t show that look and Collins evidently is fine with that. It’s a good look because both players benefited from it in a 10-win season. So we’ve reached this point. An offensive coordinator who wants to change everything that worked in two 10-win seasons for everything that does not work the last two. There is no hatred here for the man himself; there is much hatred here for his stubborn refusal to use a system that is best suited for the personnel under his command. He completely overhauled an offensive concept that worked beautifully for two seasons for one that has been an utter failure for the last two. This guy is the most ill-suited coach for Temple, assistant or head, we’ve seen since Jerry Berndt tried to jump here from the Ivies after ruining things for those other Owls, Rice. The defense has done the job this year. The skills of the players on offense are at least as good as the defense, maybe better. The lack of production on one side of the ball can only be attributed to a scheme that does not work and needs to be changed. Run an elite tailback behind a great fullback, establish the run, and hit explosive downfield plays in the passing game by using play-action fakes. I see that. You see that (at least 90 percent of you) but, unless Collins sees it, the full potential of this program will never be realized. Next Thursday would be a perfect place to implement that kind of game plan. This is Temple TUFF offensive football. Owls need to get back to it. Since Temple football emerged from the dark ages around the year 2009, there have been some pretty good Homecomings. Maybe the top one in my memory–and perhaps the best including the crowds of 70K for Notre Dame and Penn State games at Lincoln Financial Field that season–was the 35,711 fans who showed up for a 48-14 win over Tulane in 2015. That’s because literally no one came from Tulane and the lower bowl of a 70K-seat stadium was filled entirely with Cherry and White fans. Thirty-five thousand and seven hundred eleven exceeds the capacity of many of the AAC stadiums so it was a tremendous crowd. Plus, it was 4,000 more people than attended the previous game, a 30-16 win over Central Florida at LFF on the preceding Saturday night (a much more attractive time for a home game). That’s what being 6-0 and ranked nationally will do for you. That is also the situation visiting Cincinnati (6-0, ranked No. 20 in the AP poll) finds itself in when it travels to Lincoln Financial Field (noon) on Saturday for Temple’s Homecoming game. The numbers indicate that this should be a crowd that slightly exceeds the 30K mark, probably not quite up to the 32K mark for Temple’s home opener this season so it should be a special Homecoming. Every Homecoming is special because it attracts the same kind of softcore fan base that usually attends only Temple home openers. For the last eight Homecomings, for instance, the Homecoming Game drew an average of 7,654 more than the previous home game. Figure in far right column represents an average of 7,654 more than the prior home game attendance in each of those years. Will this be as special as Tulane? Only if the Owls emerge with a win and the people in Vegas are counting on it. The line opened at 3.5 points on Monday and moved slightly up to four points on Tuesday and now back to 3.5 again Wednesday. Last week’s Temple line at Navy opened with the Owls as a 4.5-point favorite on a Monday and that moved to 5.5 on Wednesday before eventually settling on seven points by Saturday morning. If nothing changes, expect Temple to win, 24-20. Still, the game is played on the field and not in Vegas and Cincinnati has a formidable 12th man. Three years ago today when No. 4 was a full-time fullback leading the way for Ryquell Armstead (and Jahad Thomas, pictured) and play-action fakes to the tailbacks allowed Ventell Byrant and Isaiah Wright to run so free through the secondary P.J. Walker did not know which one to pick out. The Temple offensive coordinator has somehow managed to turn a team with a pretty good line and dynamic players like quarterback Anthony Russo, fullback Rob Ritrovato, tailback Ryquell Armstead, and explosive downfield wide receivers like Ventell Bryant, Isaiah Wright and Branden Mack into the 89th-ranked total offense in the country. That’s a pretty hard thing to do but when you have a great fullback you never use as a fullback and, by doing so (err, not doing so) you pretty much pull the lynch pin out of this grenade and blow the whole offense up. Run Rock behind Nitro, establish the run, set up the play-action pass and Bryant, Wright and Mack become 10x more effective than they are now. Also, both Patenaude and head coach Geoff Collins have been quoted as saying the reason they don’t run the ball on first and goal is because of the defense the bad guys are in dictates the Temple play call. That’s ridiculous on face value. From the time Walter Camp invented football, it has been the offenses, not the defenses, who dictate the play call. Do you think Matt Rhule EVER cared what defense Cincy was in the video at the top of this post? If Temple is truly calling passing plays on first and goal based on the alignment of the defense across the ball, then the coaching here is worse than any of us ever thought and, for the last two years, many of us think it is appallingly bad. An offense with these players should be ranked in the top 10 in the country in total offense, certainly not ranked No. 89 as it is now. That’s an indictment on the brain trust. Somewhere in Waco, both Glenn Thomas and Matt Rhule have to be shaking their heads because you know they are laughing at Patenaude’s play-calling and personnel groupings. Knowing how much they love these kids they recruited, there are probably a few tears being shed as well. We will ever see the Temple football Owl fans have come to know and love? That is an every-down fullback (Nitro) leading the way for an elite tailback (Rock), setting up explosive downfield plays in the play-action passing game to receivers like Bryant, Wright and Mack? Probably not as long as Collins is the enabler to this spread crack addict named Patenaude. As Temple fans, we can only hope the talent overcomes the coaching or these coaches take a good look at the video at the top of this post and the light bulb finally goes on in their collective heads. Saturday: How Good is Vegas? That guy closest to the Temple fans was Colin Thompson, all alone on this throwback pass from P.J. Walker against USF. If there was anything Temple could take from the first six games of the season is not to take anything for granted. This is what I call separation, the end result of the photo at the top of this post. It’s only clever if you can’t figure it out. Since then, like last year, Temple made a quarterback change and, like last year, Temple is a completely different team since. Really, the Owls should be 4-0 since Anthony Russo took over for Frank Nutile but aren’t because two of their eight-deep receiver rotation had the dropsies against Boston College. One of the drops robbed Russo of a beautifully thrown 80-yard touchdown bomb; the other bounced off the chest and then the hands of an Owl and into the hands of an Eagle. The Owls were almost certainly headed for a touchdown on both drives and that was the ballgame. On Saturday, Temple’s game at Navy (3:30 p.m., CBS Sports) should be all about creating separation–not only in the league race against a respective foe from another division but the kind of separation that gets Temple receivers out of that traffic in the middle of the field and into making game-changing plays. There are four things that can happen when the ball is in the air and three of them are bad–a drop, an incompletion, and an interception–but there are methods that can optimize the chances for good and minimize the chances for ill. Creating separation–which the Owls really haven’t done for Russo so far–is a must going forward. Too many of Russo’s throws are designed to throw into coverage and an Owl receiver has to make a spectacular catch to wrestle the ball away from a defender. That’s playing with fire and Patenaude must find ways to put that fire out. First, establish the run. With an elite tailback like Ryquell Armstead (assuming he’s healthy), the Owls should control clock and yardage with gouging runs against a Navy defense that has been close to porous. Second, help the tailback accomplish that goal. For reasons known only to Patenaude, he has eschewed the lead fullback block that would make things soooooo much easier for Armstead. However, he did show the blocking H-back look using the tight ends as lead blockers against Maryland, so maybe he only uses it for games played in that state. We can only hope. Third, play-action. With the run established, deftly fake the ball into the belly of Armstead (or Jager Gardner), bring the linebackers and safeties up to the line of scrimmage in run support, and make the easy pass over their heads into Owl receivers running so free through the secondary that Russo won’t know which one to pick out. Fourth, the pump fake. We’re talking about the type of play that Kenny Yeboah ran free for a touchdown against the Terps here. Russo pump fakes a quick out to Ventell Bryant, who sells the play with a 37-inch vertical leap, and both the safety and the corner go for him leaving the tight end (safety responsibility) running free down the sideline for an easy six. The fact that we’ve seen only one of these plays this season is a real head-scratcher. Fifth, the throwback pass (see above): P.J. Walker had a throwback pass to tight end Colin Thompson that created a whole lot of separation in a touchdown against South Florida. Walker rolled right and looked in the right corner of the end zone before finding Thompson (far left in the top photo and all alone in the middle photo) for a score. Easy peasy stuff. If Patenaude can’t figure it out for himself, maybe he should place a call to the offensive brain trusts at Towson and Stony Brook. They can draw it up and send him a fax within seconds. If Adam DiMichele called the plays, Temple would beat ECU, 48-14; Patenaude evens the playing field or might even give ECU an advantage. Back in the day, before the great Johnny Carson died in 2005, the former Tonight Show Host had a very funny bit introducing late night movies as a character named Art Fern with a pretty blonde sidekick. Well into the skit, Carson would give directions to the auto dealership which sponsored the movies and include “Slawson Cutoff” and “Fork in the road” as the landmarks. Well, in this Temple football season, we’ve reached a Fork in the Road for the Owls (Saturday, noon, Lincoln Financial Field). Make the right turn, beat ECU, and the road could lead to the AAC championship game at Lincoln Financial Field in December or, at worst, a seven- or eight-win regular season. Lose to ECU, and there is a brick wall at the wrong turn and maybe another win or two. Owls need this one as a confidence-builder after offensive coordinator Dave Patenaude single-handedly blew a potential win at Boston College last week by not utilizing the unstoppable Ryquell Armstead, his best offensive weapon, on third-and-two. Way to take the game out of the kids’ hands, Dave. Makes one think about the way things would be with the current QB coach, Adam DiMichele, in charge. DiMichele–way more than Patenaude–understands that this group was recruited to run the ball behind an elite tailback following a great blocking fullback with two tight ends to establish the run game and set up play action. Patenaude thinks he’s still back at Coastal Carolina where he wants to spread the field. That’s Coastal Carolina Soft, not Temple TUFF. This game is far too important for Patenaude to be messing around with his pass-first, second and last system. Run the damn ball and pass only on play-action. Beat ECU and the Owls go 2-0 in the AAC and control their own fate. That’s how important this game is. Fans should not make the mistake that because the Owls won last year’s game, 34-10, the Owls will automatically win this one at home. Lincoln Financial Field has not been a home-field advantage for the Owls this season. Rather, a house of horrors, losing to an FCS team and a MAC team. That FCS team has subsequently lost to both Towson (45-38) and Stony Brook (29-27). That MAC team got destroyed by Army, 42-13. Not a terrific endorsement for the Temple football coaching staff. Nice job by Patenaude putting up nine offensive points against Nova and 22 offensive points against the worst run defense in the FBS the last two seasons. The fact that offensive coordinators with lesser talent at Towson and Stony Brook got more production out of their kids against Villanova than Patenaude did with FAR better talent is truly sickening. Now that staff is at a crossroads. ECU is a team with a Villanova moment of its own, losing to in-state FCS rival North Carolina AT&T in the opener. It also has a Power 5 moment, beating in-state rival North Carolina. The Tar Heels turned around and beat another Power 5 team, Pitt, which beat another Power 5 team, Georgia Tech. ECU also beat Old Dominion, a team which beat Virginia Tech. This is a better squad than Villanova, Buffalo or Tulsa and the Owls better buckle their chinstraps and Collins better be prepared to overturn Patenaude’s play calls. Temple’s Power 5 moment was a 35-14 win at Maryland, but the Owls staff did not take the day as a teaching moment because the H-back blocking look that opened running lanes for Ryquell Armstead and passing lanes for Anthony Russo has not been shown before or since. That’s a good look for the Owls and the personnel groups they have on offense, but does this staff even realize it? We should find out tomorrow at, say, 3:30 p.m. Based on the other two Saturdays at home, I’m more hopeful than optimistic. Hopeful that Patenaude oversleeps and misses the team bus and Temple TUFF Adam DiMichele is forced to call the plays. Otherwise, about 60,000 nails belonging to 20,000 people are in jeopardy of being bitten off. Somewhere, Dave Patenaude, err, Patenfraud, is lighting up a cigar figuring he did a great job getting 27 points on the board for the Owls (remember seven came as a result as a fumbled kickoff). Saturday’s 45-35 loss to Boston College was a team loss, no doubt, but one man who does not understand Temple football is getting in the way of greatness for this team and that’s Patenfraud. Not only was his play-calling abysmal–now the ESPN announcers are seeing what we have been all year and hammered him for it–his personnel groupings are horrendous. We won’t get into names here but Nos. 80 and 81 should be disqualified from the field for the rest of the season, not for targeting, but for being targeted in any play package going forward. Both not only dropped touchdown passes in each of the last two weeks but committed the exacta of having balls bounced off their hands and chests into drive-killing interceptions. Those two dropped certain beautifully thrown touchdown passes from Anthony Russo at BC. Isaiah Wright and Ventell Bryant should be the permanent wide receivers, period, end of story. Keep them on the field. Imagine if the two dropped passes were thrown to either Wright or Byrant, instead of 80 and 81? We’d be talking about two touchdowns and a Temple win right now, and two touchdown passes by Russo in addition to four touchdown runs by Ryquell Armstead. How is it that Rob “Nitro” Ritrovato makes a great play in special teams that results in a touchdown and he doesn’t see the field except for six more plays the rest of the game? Nitro should be the full-time fullback leading the way for Ryquell Armstead. Russo, Armstead, Nitro, Bryant and Wright are by far … BY FAR … your best offensive players. Keep them on the field. There’s no need for backups unless the starters get hurt. So far, they haven’t gotten hurt. Put your best players on the field and accept the consequences, which probably will be quite good. Don’t lose the game messing around with backups and that’s what Patenaude has done all season in addition to a scatterbrained offensive scheme that doesn’t in the least resemble what Temple did in double-digit win seasons. You want facts? How is it possible that Towson–with freaking TOWSON talent–scores 45 points on Villanova, Stony Brook 29 points and Temple scores only nine offensive points on that FCS team? How it is possible that a team with a terrific young quarterback in Russo, a great tailback in Armstead, a great fullback in Nitro and two great wideouts in Bryant and Wright gets ranked 112th in total offense (out of 127 teams)? Patenaude, err, Fraud, that’s how. Those are the facts, Jack. Is the Towson offensive coordinator available? Run Rock behind Armstead getting lead blocks from Nitro, control the clock and keep the sticks moving with the occasional play-action toss to either Bryant or Wright. Football isn’t rocket science. Those guys are your money players on offense. Keep them on the field for all four quarters. Give them the ball. No need to give it to anyone else, with the possible exception of the tight ends or the sure-handed Branden Mack. That way, the game is managed with long drives, scores and that helps your defense. If Geoff Collins doesn’t realize by now that Patenaude is the problem, then HE is the problem. Collins’ job is not nor should not be in jeopardy, but athletic director Pat Kraft can nudge him to put Ed Foley or Adam DiMichele in the OC role. Patenfraud is killing Temple. The coordinators are on year-to-year contracts and Temple won’t be out any money replacing them. Collins should be able to see that the good of organization must supersede professional coaching friendships. Matt Rhule saw that with his OC, Marcus Satterfield, and only by demoting him after Year Two allowed Temple to play for a championship in Year Three and win one in Year Four. These Temple kids are too talented to wait that long this go-round. Defensive coordinator Andrew Thacker should also be on notice. Everybody and his kid brother knew Boston College tight end Tommy Sweeney was that team’s best receiver all week. How do you not stick your best safety, Delvon Randall, on him and tell him to be in his face all afternoon? Speaking of that, can Collins please stop calling his defense The Dark Side Defense? No defense that gives up 45 points to anyone can be called a Dark Side defense. Until they shut someone out, like Chuck Heater’s defense did in back-to-back games in 2011, call them the Light Side Defense. 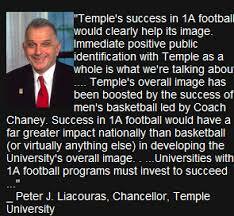 Stop the gimmicks and nicknames and play hard-nosed Temple football. If Collins and Patenfraud don’t know what that looks like, just pop in the tapes of the consecutive 10-win seasons, start taking notes and devising game plans that look somewhat like we all saw not that long ago. It’s not that hard. It’s football, not rocket science. Tuesday: Where Have We Heard This Song Before? Interesting that Daz takes credit for a practice facility that was largely built 10 years before he got here (16-minute timestamp). In this case, the irony is not that the Owls will be facing a guy in Steve Addazio, who not only left Temple (after pledging eternal loyalty) for two years. That’s a coincidence, not ironic. Boston College is running the same offense Temple should be running now, while Temple is fumbling and stumbling through the same offense Matt Rhule struggled with in his first two years before abandoning it for one that personified the core principles of Temple TUFF established by Wayne Hardin and Bruce Arians and followed through by Al Golden. By “deliberately contrary to what one would expect” we’re talking about the offense Daz ran here his second year, which broken down into basics was: run, run, throw (sack), punt. During his first year at Temple, Scot Loeffler was in charge of the offense and it was based on the concepts that the Owls always won by: Establish the run behind two tight ends and a fullback, force the safeties and linebackers up to the line of scrimmage where they would be susceptible to play-action passes. Loeffler went onto Virginia Tech after his first year here and Daz went back to the habits he formed at Florida. Now that Loeffler is in charge, Daz has made him “head coach of the offense” and that’s why the BC offense is succeeding where Temple’s is failing. In Boston, it is run the ball behind an elite tailback (A.J. Dillon) and use play action to make explosive downfield plays in the passing game. Know any other team that has an elite tailback with explosive downfield receivers? If it doesn’t piss you off that Ventell Bryant and Isaiah Wright aren’t getting any separation, it should. It is not the fault of the kids, either; same players got routinely wide open under Matt Rhule’s play-action-oriented scheme. Those guys can do so much damage in a pro set but Patenaude wants nothing to do with it. In any other job, that would be considered malfeasance. We saw a glimpse of that offense for Temple in Maryland, when the Owls were disciplined enough to stay focused in an H-back blocking look for their own elite tailback, Ryquell Armstead, whose success in the run game set up some nice play-action looks in the passing game for unbeaten quarterback Anthony Russo. Success in the run game allowed Russo to fake an out beautifully to Bryant (who sold it with a great leap) and that drew two Maryland defensive backs to Bryant, allowing tight end Kenny Yeboah to run free. Yeboah and Chris Myarick not only blocked well but caught key passes to keep the sticks moving. Temple really had not used its tight ends effectively in the Dave Patenaude Error until that afternoon. Last week, against Tulsa, the Owls lapsed into the same unfocused look they showed in losses to Buffalo and Villanova. It was not a good look. This is the same kind of crisis Rhule had after his second year at the helm. His talent dictated run/play action but his offensive coordinator at the time, Marcus Satterfield, was stubborn about running the spread look. Rhule had the cojones to demote Satterfield to wide receiver coach and hire a guy from the Atlanta Falcons, Glenn Thomas, who implemented a more pro-style look that coincided with the Temple TUFF brand. So far, it looks like Temple head coach Geoff Collins is satisfied with handing the keys of his offense over to a drunk driver rather than someone with vision and sharp reflexes. Maybe that will change. Maybe it will be Saturday. We saw this movie before, though. All last year and three of the four games this year. It’s like Waiting for Godot. The essence of great coaching is to get the most out of the talent you have, not the talent you want. Establish the run behind a great tailback in Ryquell Armstead following a great blocking fullback in Rob Ritrovato and immensely talented receivers like Bryant, Wright and Branden Mack can get the kind of separation they need to cause serious damage. Boston College runs the exact same offense Temple should be running with its personnel. That’s irony. The Temple challenge on this Saturday will rest in being smart enough to fight BC’s fire with some of the same fire of its own.